NBA – Indiana Pacers superstar and 4× NBA All-Star Paul George is the hottest name on the list of NBA players in trade rumors this 2017 NBA off season. Paul George has recently informed his current team that after 2017 - 2018 NBA Season he will not return as a Pacer and more likely going to another team which the favorite to land is his home town LA with the Lakers. Since the announcement of George leaving the Pacers, the Pacers have immediately begun trade talks involving Paul George with other teams, including the Cleveland Cavaliers, who recently loss the 2017 NBA Finals against the Golden State Warriors. According to rumors the Pacers will trade Paul George in exchange of Kevin Love? A deal that Pacers could win rather than losing Paul George in the 2018 NBA Off season? 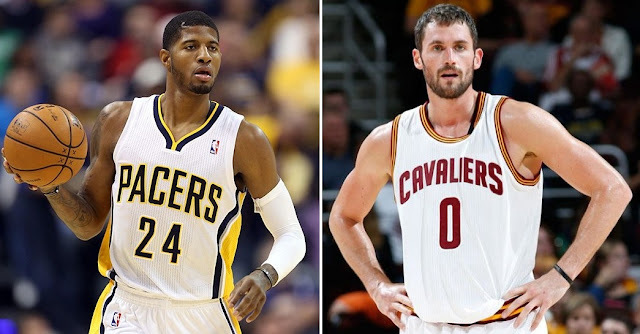 If Paul George and Kevin Love trade happen? George will play for the Cavs for one year as a rental player? And the next season he is free to leave the Cavaliers with his own decision, but what if the Cavaliers became champion along with the George next season? That’s another question that can put George and the Cavaliers for a long term contract if George wants to be a Championship contender every year or go home in LA with the rebuilding team like the Lakers? The addition of Paul George to the Cavaliers will improve their offense and more especially their defense and in preparation of once again facing the Warriors in the Finals for the 4th straight year? George will be designated player to guard the 2017 NBA Finals MVP Kevin Durant to play some defense and to lessen the burden of LeBron James defending Durant. George is more likely will be the third options on Cavs team when it comes to who will be the main man of the Cavaliers and with no doubt LeBron James will still be the franchise players of the Cavs. If this trade happens Paul George alongside with Kyrie Irving and LeBron James, forming the new "Big Three"in Cavs? Then the Warriors will not easily pass or beat the Cavaliers in their impending 4th meeting in the Finals? This could be a good series or might be a long series that could lead to 7 games? this could doubt as the clash of super teams? It is expected that the Warriors will come out as the Western Champion again this coming 2017 – 2018 NBA Season so as the Cavaliers in the East? What would you think of this trade rumor? Will the Pacers and the Cavs agree of trading players? Let’s wait and see this coming days? No Comment to " Paul George on Trade Rumors Going to Cavaliers "